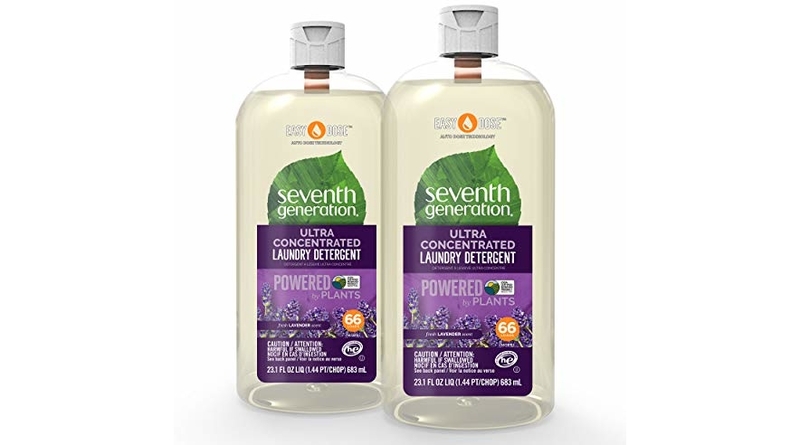 The Seventh Generation Laundry Detergent, Ultra Concentrated EasyDose, Fresh Lavender, 23 oz, 2 Pack (132 Loads) is now priced for $25.98 but clip the WHOPPING 30% off coupon and the price at checkout drops to just $18.19! Grab an even sweeter discount and save up to an extra 15% off when you checkout via the Subscribe & Save option making the price as low as $14.30 or $7.15 per 66 load bottle! Our compact 23oz bottle gives you the same 66 load convenience you expect, but uses 60% less plastic, 50% less water, and is 75% lighter than our 100oz bottle. With a refreshing lavender scent made with essential oils and botanical ingredients, and an advanced enzyme formula that fights tough stains, it’s a great choice for your busy family.